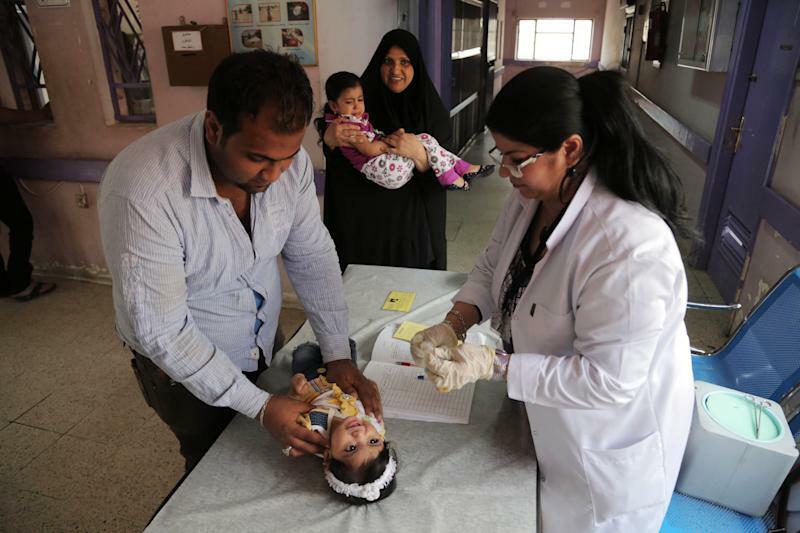 BAGHDAD (AP) — Across parts of Iraq, medical teams in white coats and gloves again roam the streets giving children polio vaccines and marking the walls of their homes, fighting a resurgent virus once more taking advantage of the country's turmoil. The World Health Organization declared Iraq polio free in 1990, just before Saddam Hussein launched his invasion of Kuwait. The virus returned and health officials' efforts saw the last case reported in 2000 — until a 6-month-old boy contracted it in March in a north Baghdad neighborhood. "As if we are living our life with no problems to have now this polio issue," said a fuming Mustafa Salim, a police officer and father of two recently vaccinated children in Baghdad's eastern neighborhood of Sadr City. "Now, I have another thing to be obsessed with in addition to my safety and my kid's future in this country. "With the continuing fighting in Syria and political wrangling and deteriorated security situation inside Iraq, I'm afraid more diseases will attack us along with the daily bombings." Polio remains endemic in three countries around the world — Afghanistan, Nigeria and Pakistan — but it spreads in unsanitary conditions often exacerbated by warfare. It is highly infectious and usually strikes children under 5. The disease attacks the central nervous system, and can cause paralysis, muscular atrophy, deformation and, in some cases, death. In Iraq, international agencies helped the country administer vaccines purchased under the United Nations' oil-for-food program in the 1990s, fighting back a new outbreak of the disease then. After the 2003 invasion, health officials again began vaccinations, but often found themselves blocked from entering neighborhoods over raging sectarian fighting. Now that fighting has begun again in Iraq, which last year saw its highest death toll since the worst of such killings in 2007, according to the U.N. That's coupled with an influx of Syrians fleeing the civil war. Laboratory testing showed that the virus detected in Iraq's new polio case closely resembles the virus found in Syria, according to the WHO. 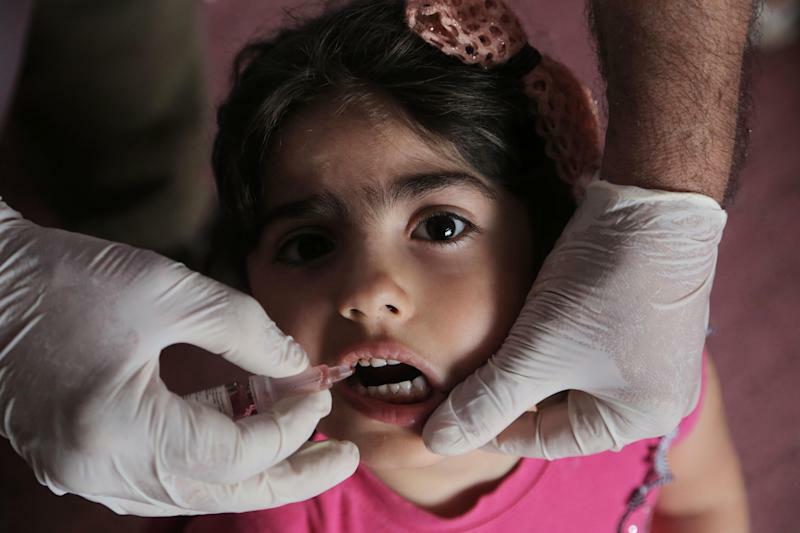 UNICEF, the U.N.'s children agency, says that polio has paralyzed at least 18 children in Syria's Deir el Zour province, located along the border with Iraq. Iraq's Health Ministry, backed by UNICEF and the WHO, launched a new round of polio immunizations this week, trying to reach all 5.6 million children 5 years old and younger across the country. Authorities also have sponsored a radio and television ad campaign, as well as sent text messages warning about the danger of the disease. "Up to now, our reports indicate that there is a good turnout," Health Ministry spokesman Ziad Tariq said. "We are not expecting to cover all the children, but at least 80 percent, which is good." Teams also are working to reach children in Anbar province, where militants from the al-Qaida breakaway group called Islamic State of Iraq and the Levant and other Sunni groups hold parts of the provincial capital, Ramadi, and nearly all of the nearby city of Fallujah. Tariq declined to elaborate. 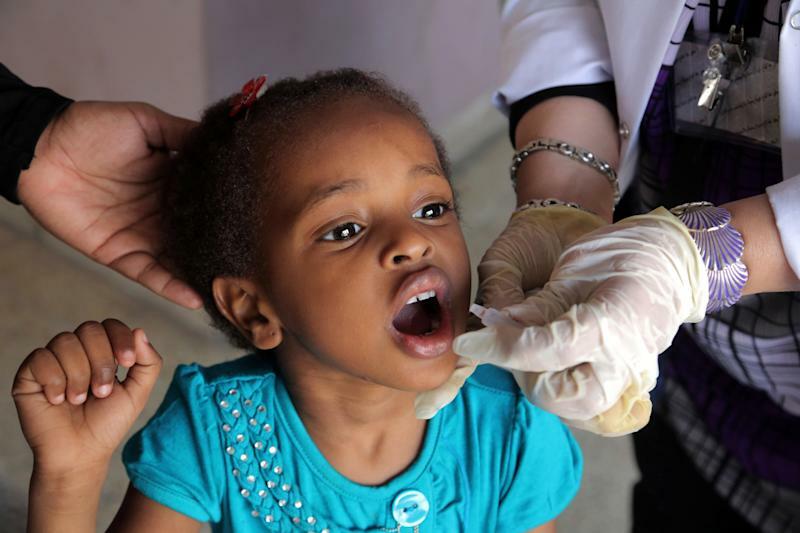 Gopinath Durairajan, an official with UNICEF's polio team in Iraq, said most of the children in Anbar province could not be vaccinated due to the unrest. "Anbar is going to be an issue for us," Durairajan said, adding that more vaccination rounds may be organized with the Health Ministry.